The country hopes building connections with overseas researchers will help lift its research performance. Policy-makers have looked to international collaboration as a way to arrest the alarming decline in Japan’s contribution to global science. This Nature Index supplement reports on the progress of that effort. There is change for the better. Since 2014, when the Organisation for Economic Co-operation and Development urged Japan to become more involved in global innovation networks, the proportion of articles from Japanese institutions with international co-authors in Nature Index journals has risen from 46% to nearly 56%. The work of researchers such as the six profiled here has been instrumental in this rise. These scientists — chosen for their high-quality output and outstanding global networks — are reaching out from Japan and building links back from abroad. But the fall in Japan’s contribution to high-quality scientific output has continued. Japan’s fractional count (FC) in the Nature Index declined 1.7% between 2017 and the 12 months leading up to 31 October 2018, bringing the reduction in FC since 2012 to 19.9%. It’s too soon to say whether the rate of decline is slowing. In any case, international collaboration is only part of a solution. 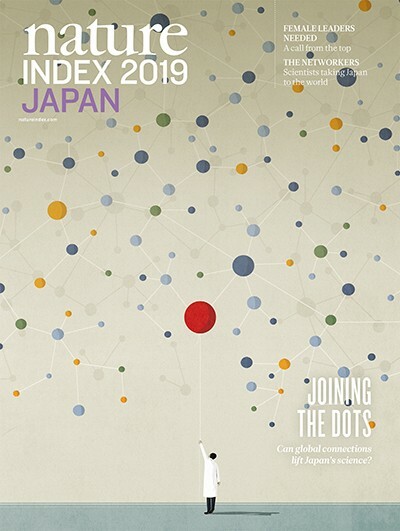 Japanese institutions should strive to create an outward-looking scientific ecosystem, with a diverse and highly connected workforce. Achieving that will require cultural change to tackle rigid hierarchies, modernise work practices and reward systems, and foster new talent. When, or if, Japan becomes a research destination for the world’s scientists, we’ll know the necessary change has taken place.